I recently celebrated my birthday at Cafe Fiorello (1900 Broadway between 63rd and 64th streets) — birthday dinner there has become somewhat of an annual tradition for me. Although it has been around for nearly 35 years, it is still a neighborhood favorite, busy with “regulars” as well as Lincoln Center theater-goers and tourists. The food is delicious. The menu has changed slightly over the years, but the general feel and type of items has remained the same. Changing the menu has also resulted in rising prices. Cafe Fiorello is famous for its thin crust pizza and has recently added a whole wheat vegetarian version made with soy mozzarella. It is also known for its sprawling Antipasto bar. Many dine at the bar, but anyone can order from the numerous selections, which include cold seafood dishes, vegetables and a several hot items, like the Sausage and Peppers or the Cauliflower Almondine. My favorite is the Brussell Sprouts! They are sauteed just perfectly and served room temperature. In addition, the main menu offers many fish, pasta, salad and meat items to satisfy every palette. For my birthday dinner, I ordered the Lobster salad, which was a new Appetizer special. It was incredible — I hope it becomes a permanent item on the menu (which is what happened with the Seafood risotto – long a special and now a fixture on the latest menu). 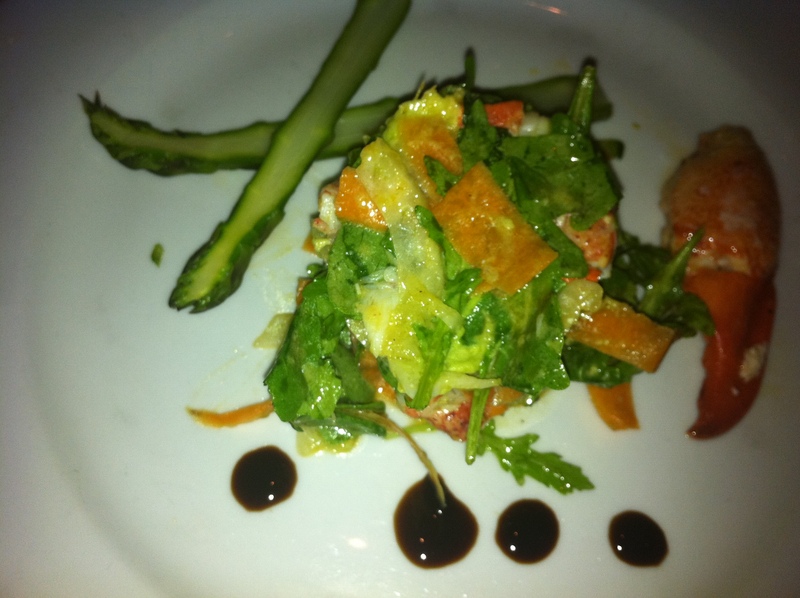 I’ve attached a photo of the lobster salad, since the presentation was as fabulous as the taste. Ingredients included lobster, arugula, fennel, carrots, avocado, and asparagus in a very light dressing. For those of you interested in celebrating a birthday at Cafe Fiorello, it will be an eventful evening. Dessert is served with a candle and brought to the table by several singing waiters with opera-style voices. A fun and festive touch! And, if you’re not sure what to order for dessert, try the Profiteroles. 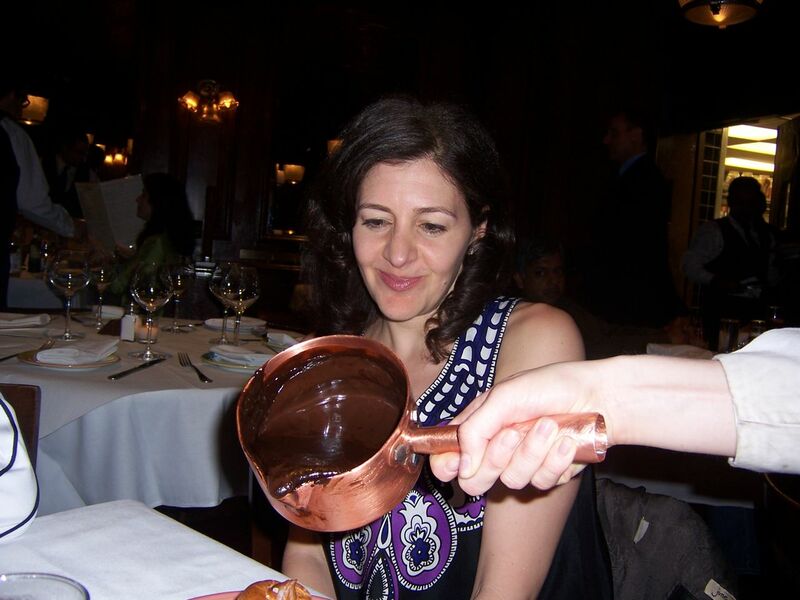 Once he/she brings the plate to the table, the waiter pours the hot fudge from a copper pot over the ice cream-filled pastry puffs. I’ve attached a photo from last year’s b-day profiteroles. I could write many pages on Cafe Fiorello, as it is one of my favorite restaurants in New York. Instead, I will wet your tastebuds with just the above brief description and recommend you to check it out. Plus, as a reminder, Cafe Fiorello offers outdoor seating. Despite the sound of a few buses going by, the view of Lincoln Center is worth it. And with Spring finally having arrived in New York, now is a perfect time to try it. Note that it is usually packed between 5pm and 8pm due to pre-theater, so if you prefer a slightly less busy scene, I recommend going after 8pm.